The photography world is set to go through a revolution thanks to physicists at Harvard who have pushed the physical limits of light to its very limit. The researchers claim to have created a 'perfect image' using a new type of lens. The team have created an ultra-thin, flat lens which is a mere 60 nanometers thick - making it essentially two-dimensional, yet still managing to focus light without distortion. 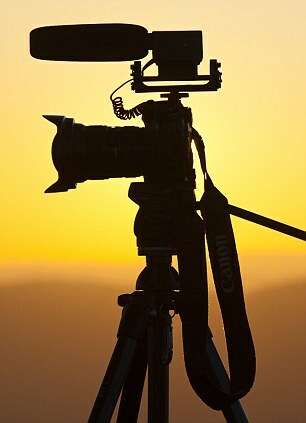 The technology could revolutionise everything from professional and smartphone photography to fibre-optic cables, used for transmitting data and video, as lenses need be bulky no longer. Principal investigator Federico Capasso said: 'We’re presenting a new way of making lenses. 'Instead of creating phase delays as light propagates through the thickness of the material, you can create an instantaneous phase shift right at the surface of the lens. It’s extremely exciting. 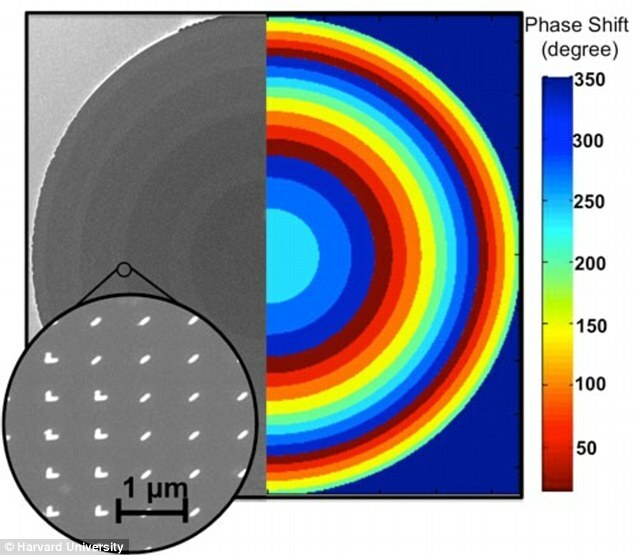 Capasso and his collaborators at SEAS create the flat lens by plating a very thin wafer of silicon with a nanometer-thin layer of gold. Next, they strip away parts of the gold layer to leave behind an array of V-shaped structures, evenly spaced in rows across the surface. When Capasso’s group shines a laser onto the flat lens, these structures act as nanoantennas that capture the incoming light and hold onto it briefly before releasing it again. Those delays, which are precisely tuned across the surface of the lens, change the direction of the light in the same way that a thick glass lens would, with an important distinction. The flat lens eliminates optical aberrations such as the 'fish-eye' effect that results from conventional wide-angle lenses. Other common aberrations also do not occur with the flat lens, so the resulting image or signal is completely accurate and does not require any complex corrective techniques. The array of nanoantennas, dubbed a 'metasurface', can be tuned for specific wavelengths of light by simply changing the size, angle, and spacing of the antennas. Lead author Francesco Aieta said: 'In the future we can potentially replace all the bulk components in the majority of optical systems with just flat surfaces.